A 10-year-old girl with atopic dermatitis reports itching that has recently become relentless, resulting in sleep loss. Her mother has been reluctant to treat the girl with topical corticosteroids, because she was told that they damage the skin, but she is exhausted and wants relief for her child. How should the problem be managed? 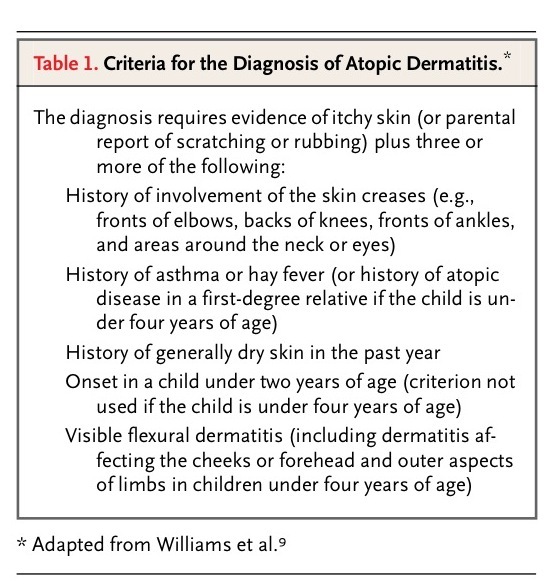 Criteria for the Diagnosis of Atopic Dermatitis.). Concomitant food allergy may be manifested as urticaria and gastrointestinal symptoms and may not necessarily exacerbate atopic dermatitis. Double-blind, placebo-controlled food challenges are the standard for diagnosing associated food allergy, but they are time consuming and not available in many hospitals. One systematic review identified 83 randomized controlled trials of the use of topical corticosteroids in atopic dermatitis.30 Vehicle-controlled studies lasting less than one month indicate that approximately 80 percent of people report good, excellent, or clear responses with topical corticosteroids, whereas 38 percent of persons in control groups reported such responses. 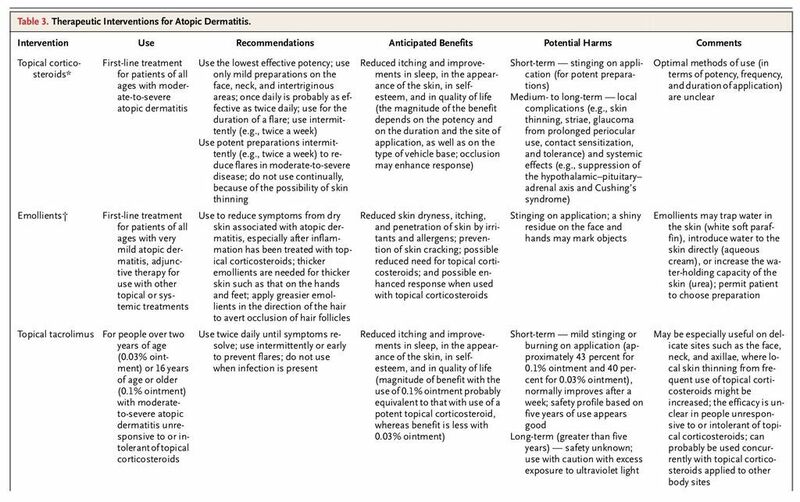 Therapeutic Interventions for Atopic Dermatitis.). In general, only preparations that have very weak or moderate strength are used on the face and genital area, whereas those that have moderate or potent strength are used on other areas of the body.31 Lower-potency corticosteroids may be sufficient on all areas of the body in younger children. Preparations are typically used in bursts of three to seven days in order to achieve control. 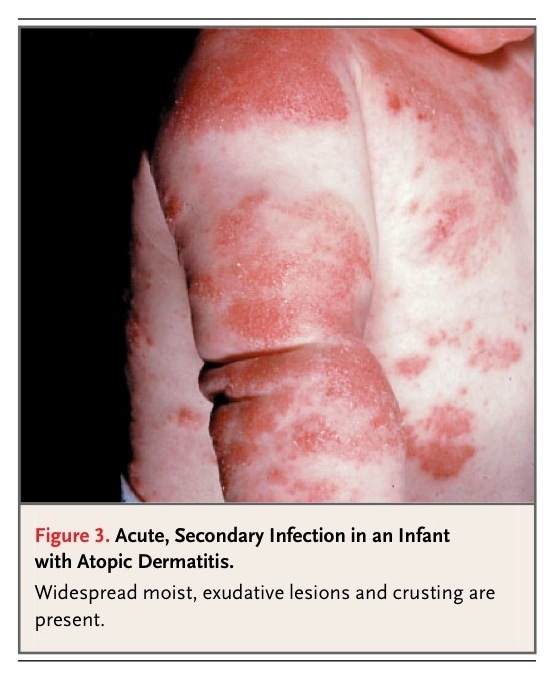 There is little difference in outcome between short-term use of potent preparations or longer use of weaker preparations in children with mild-to-moderate disease.32 Lichenified atopic dermatitis requires more potent preparations for longer periods. Reduced efficacy of topical corticosteroids may be related to disease severity rather than to glucocorticoid resistance.35 There is little evidence that the application of topical corticosteroids twice a day is more effective than once-daily applications,36 and more frequent use may cause more local side effects. A main concern with the use of topical corticosteroids is irreversible skin thinning. Although thinning is possible, the concern on the part of patients (and parents) is often well out of proportion to the true risk.37 Although inappropriate use of potent preparations can cause skin thinning, four 16-week randomized trials did not show any clinically significant skin thinning,32-34,38 and a 1-year study showed no significant effect on collagen synthesis.39 A one-year study of unrestricted continual use of a potent corticosteroid on the limbs and trunk, a weak preparation on the face, or both showed that striae developed in 3 of 330 adults with moderate-to-severe atopic dermatitis.40Similar studies in children are lacking. Other possible side effects of corticosteroids include facial telangiectasia and glaucoma from periocular use (rarely reported in adults). Few long-term studies compare intermittent use of topical calcineurin inhibitors with intermittent use of topical corticosteroids. A 12-month vehicle-controlled study of children with atopic dermatitis showed that early use of pimecrolimus reduced the frequency of flares from 51 percent to 28 percent,48 although early use of mild topical corticosteroids might have shown similar effects. Topical calcineurin inhibitors do not cause skin thinning. Both tacrolimus and pimecrolimus are associated with mild burning sensations when applied to the skin (Table 3). Five-year studies show a good safety profile for these agents.49 In the United Kingdom, the National Institute of Clinical Excellence approves the use of topical tacrolimus for children older than two years of age with moderate-to-severe atopic dermatitis not controlled by topical corticosteroids, and of topical pimecrolimus as a second-line option for resistant dermatitis of the head and neck.50 In the United States, both of these topical calcineurin inhibitors are approved as second-line agents, and the site of application is not restricted for pimecrolimus. In March 2005, the Food and Drug Administration issued an alert to health care professionals concerning a potential link between topical pimecrolimus and tacrolimus and cancer (mainly lymphoma and skin cancer) on the basis of studies in animals, case reports, and knowledge of how these drugs work.51,52 The alert emphasizes the importance of using these preparations only as labeled and when first-line treatment has failed or cannot be tolerated. A study of a refined-coal cream used on one side of the body in adults with mild-to-moderate atopic dermatitis as compared with 1 percent hydrocortisone used on the other side suggested similar efficacy after four weeks.53 There is insufficient evidence to conclude whether topical cromoglycate preparations are effective.30,54 Other topical treatments — such as St. John's wort cream, vitamin B12, and licorice gel — whose use is supported by single small, randomized trials require further evaluation before they can be recommended for the treatment of atopic dermatitis. 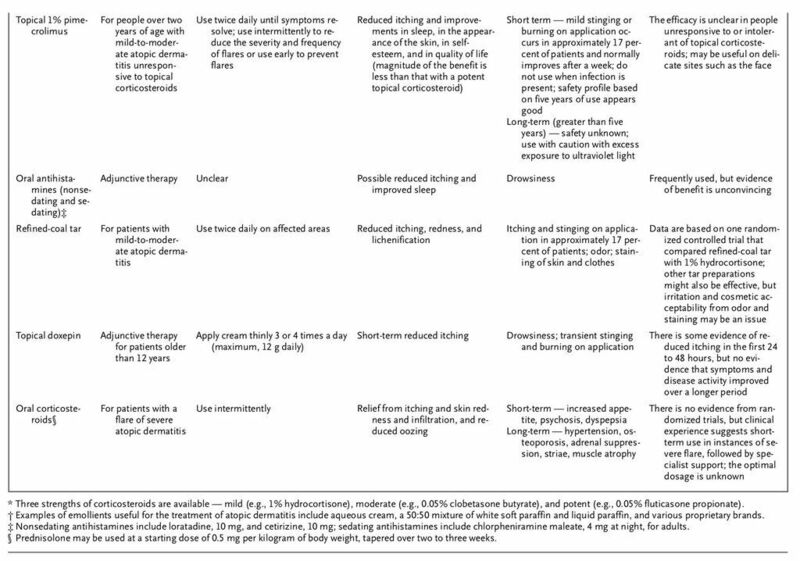 Randomized trials are lacking to assess the benefits of many simple interventions, such as emollients and other nonpharmacologic approaches.30 The lack of common outcome measures hinders meaningful comparisons across trials.11 Trials with active comparators are needed to inform choices among agents.47 Data on the optimal use of topical corticosteroids are needed, along with long-term data on adverse events. 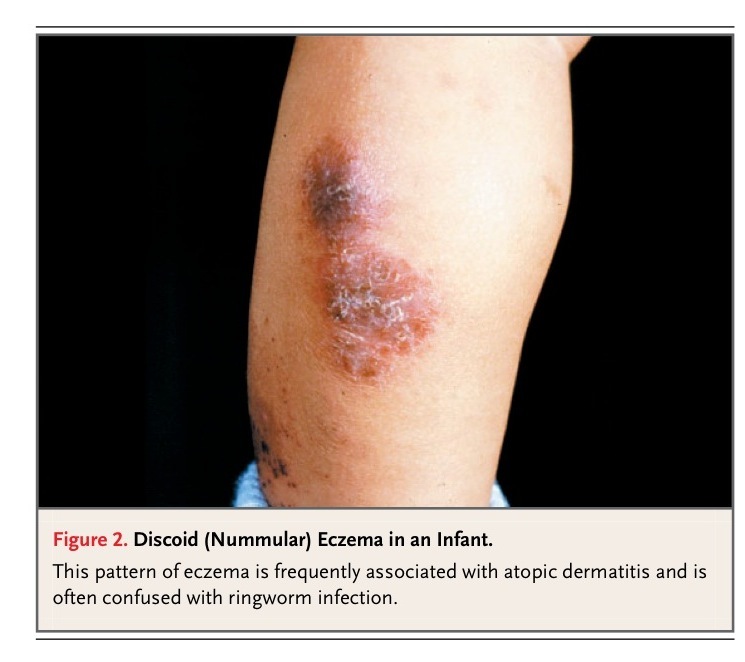 Data concerning the long-term safety of topical tacrolimus and pimecrolimus are also needed. 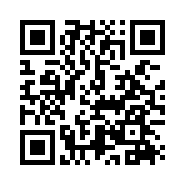 The benefits of routine allergy testing require clarification. 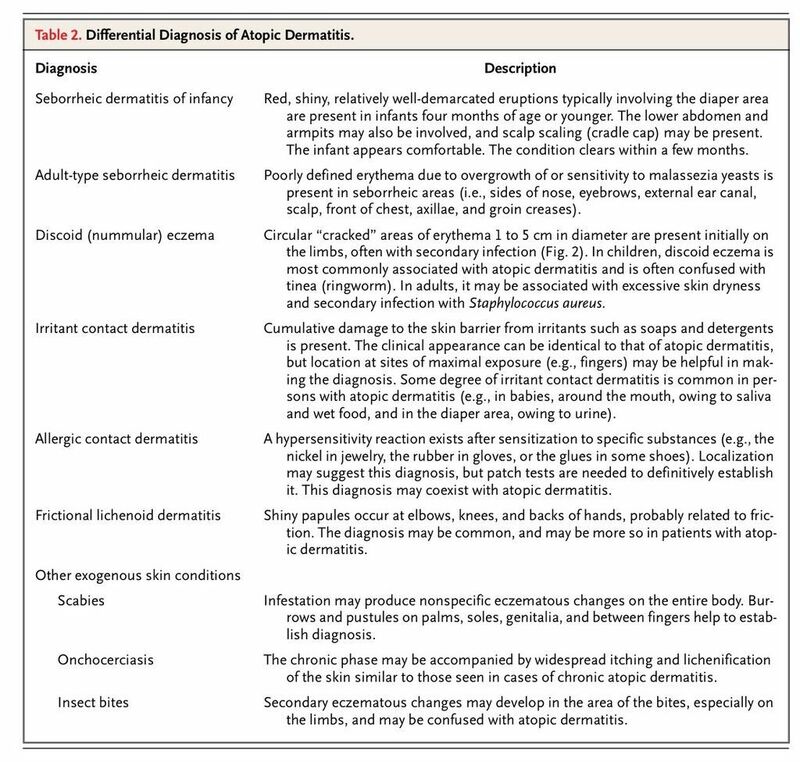 Moreover, it is unclear whether early aggressive therapy in children with atopic dermatitis alters the natural history of the disease. 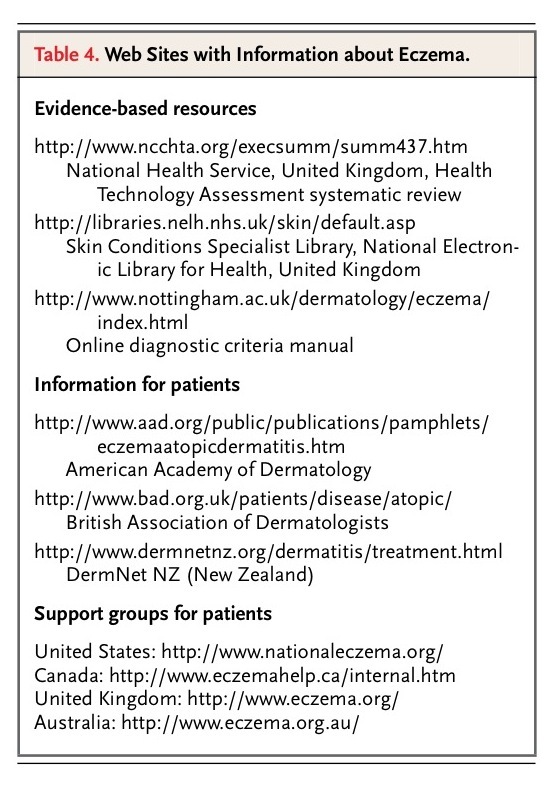 Web Sites with Information about Eczema.). Patients and families, such as the girl and her mother who are described in the vignette, often have concerns about topical corticosteroids that can be alleviated by appropriate education.68 Patients and families should be taught about the course of atopic dermatitis; that is, that a single cause and cure are unlikely, although good control is nearly always possible. Discussions should be supplemented by written information and a demonstration of the use of topical treatment.